This article by Jerry Cates, with contributions of specimens from Thang Dang, et al., first published on 11 September 2012, was last revised on ber 2012. © Bugsinthenews Vol. 13:09(01). In late August 2012 I was called to a medical facility in the western portion of the city of Houston, Texas [the nature of the facility, and its exact location, are not divulged in this article in order to protect the privacy of facility staff and patients], to deal with an invasion of ants that were gaining access to the facility’s interior. The ants involved at that time were darkly colored and of two sizes. Worker ants were tiny, only a few millimeters in length, but they were accompanied by larger reproductive ants that had wings. The ants did not bite or sting [aggressive fire-ant control measures were in place and appeared to be working properly], but were present in sufficient numbers to alarm the nursing staff. I first collected a few specimens for examination at the lab. At the time my portable microscope wasn’t with me, but shortly afterward I made it habit to carry the microscope wherever I go, so specimens can be examined microscopically and identified to genus and species at time of collection. The ants were gently plucked from the floor, walls, and furniture with an ethanol-soaked swab, and preserved in glass vials of ethanol. One kit of specimen collection vials was provided to Thang Dang, the maintenance supervisor at the facility, and another was given to the facility nursing director, so that additional specimens could readily be collected by them or members of their respective staffs if ants were observed later. The kits contained five one-ounce vials of ethanol, a non-sterile swab, a set of immersible, archival-quality linen vial labels, and a disposable india ink pen with which to inscribe the labels. After performing a treatment regimen known to resolve occasional ant invasions of this sort, I inspected the grounds in the vicinity of the invasion to confirm that fire ants were not involved, then inspected the remaining grounds surrounding the facility to ensure that no additional ant issues were in evidence. The landscaping at this facility is manicured, in good condition, and both adequate and appropriate for the setting. By that I mean that the landscape is sufficiently populated with botanicals to be esthetically pleasing, but that nothing in its architecture provides for unusual harborage conditions particularly attractive to invasive ants, such as expanses of thick jasmine ground cover, effusive shrubbery that obscures the foundation, or botanical arrangements that impinge on the structure’s exterior walls. Unfortunately, however, the property is bordered on at least one side by a dense natural wilderness area of mixed hardwoods and conifers underlain with a thick, impenetrable undergrowth of low trees, shrubs, and vines. This wilderness area, which is separated from the facility grounds by a curbed asphalt drive and a narrow grassy border, cannot be treated for pests, yet provides excellent harborage for all the insect, arachnid, and mammalian organisms typically found here, at the southern extremity of the transition between the Texan and Austroriparian biotic provinces of Texas (as described by Blair, 1949). As I gazed once more at this wide expanse of wild, untamed forest, I wondered afresh how its proximity to this facility would impact and drive my efforts to keep this facility free of pests. Finally, my work on this visit now complete, I documented the treatment program that had been carried out and returned to my lab in Round Rock. At the lab the collected ant specimens were examined under a dissecting microscope to identify their distinguishing anatomical characters. Each had a twelve-segmented antenna without a club, and a single-noded petiole that was concealed from view, dorsally, by the first tergite of the gaster. None possessed a visible postpetiole. All were absent a sting but lacked the round, hair-ringed orifice (acidopore) of ants in the Formicinae subfamily. 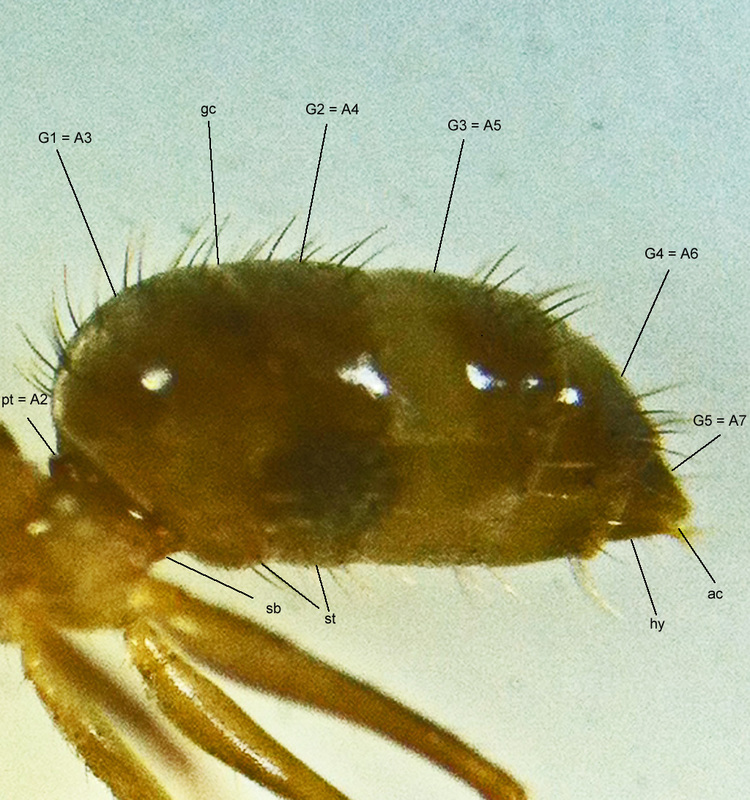 These characters — in combination — typify ants in the subfamily Dolichoderinae, specifically odorous house ants (Tapinoma sessile Say). 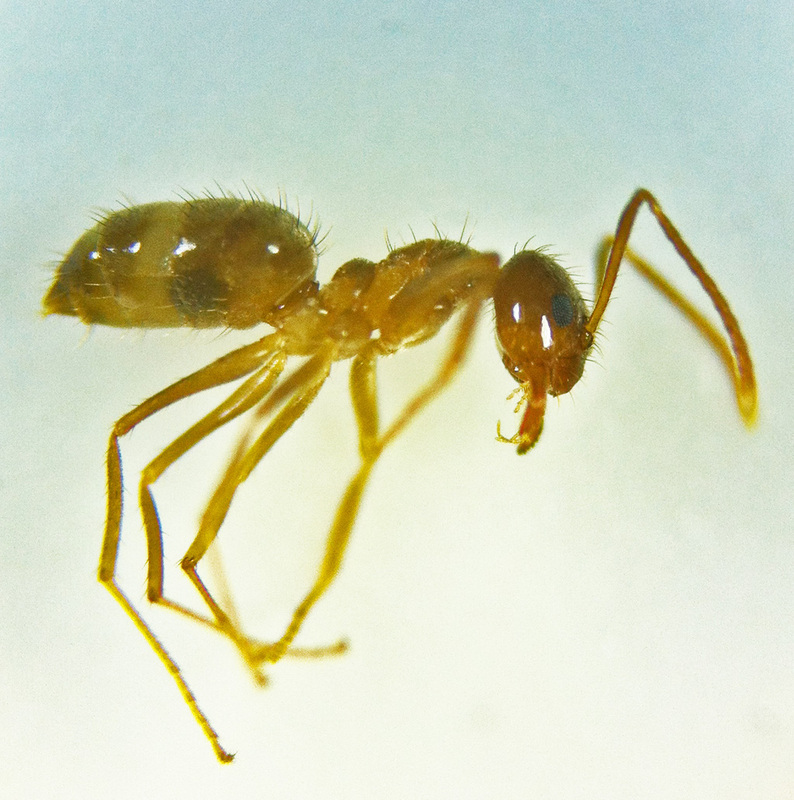 These ants are annoying, and when crushed they exude an odor similar to rotten coconuts (Mallis, 2011), but because they do not bite or sting, and have not been shown to carry or spread disease, they do not pose imminent medical risks to humans. Most important, they are amenable to control measures of the kind performed on the treatment visit described above. However, they forage tirelessly, night and day, over hundreds of yards from their nests. Nothing in the facility grounds appeared suitable for nesting activity, so chances are they are foraging from nests in the nearby wilderness area. That means they will return, repeatedly, unless extensive habitat modifications are carried out to eliminate all conditions in the grounds and facility interior that attract and nurture them. I took photos through the microscope lens for documentation purposes, and began searching the literature to confirm their identity to subfamily and further identify them to genus and species. That work, which required detailed mensuration of a number of critical anatomical characters, was soon interrupted by more urgent projects, and was put aside until additional time could be made available. Approximately two weeks later I received another report that this facility had again been invaded by ants. Immediately I cleared my schedule for the day and returned to Houston. This time the ants were of a different species. That was not surprising, as the bordering wilderness area likely harbored a variety of ant species, most or all of which could be expected to show up at this facility from time to time if given the opportunity. The ants collected on this visit were lighter in color than those collected earlier. They also had a reddish hue, and were somewhat larger than the tiny worker ants observed before. None had wings. As before the ants did not bite or sting, but — again, as before — were present in alarming numbers. I collected specimens, performed a standard ant control regimen similar to that done on the previous visit, examined the grounds again for evidence of additional ant sources — finding none — and documented my work. Before departing the facility I examined the newly collected specimens using the portable microscope I now carried with me. 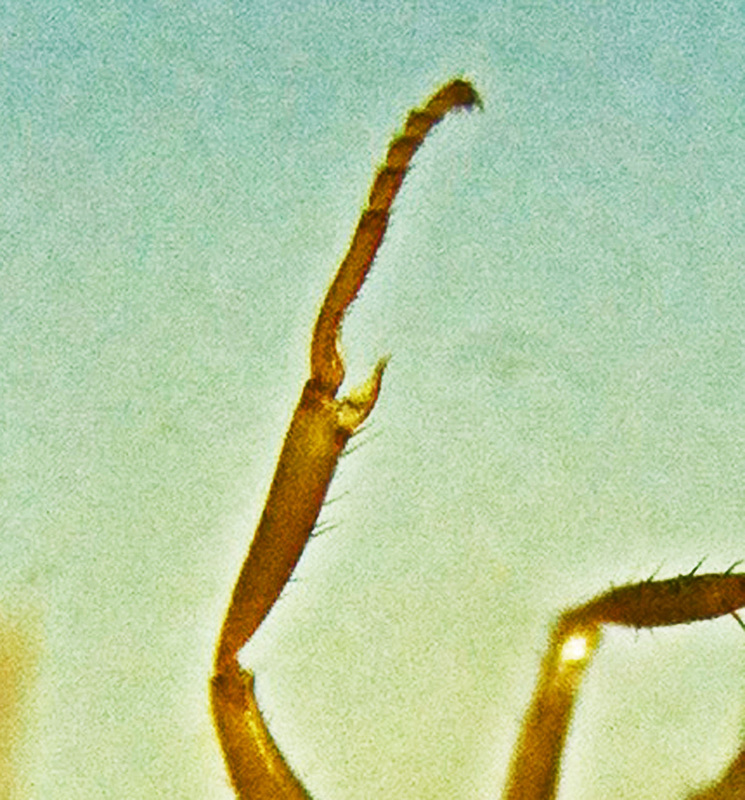 Under magnification the ants presented an intriguing picture: their legs were somewhat longer than usual, but not as long as those of the common longhorned crazy ant, Paratrechina longicornis. 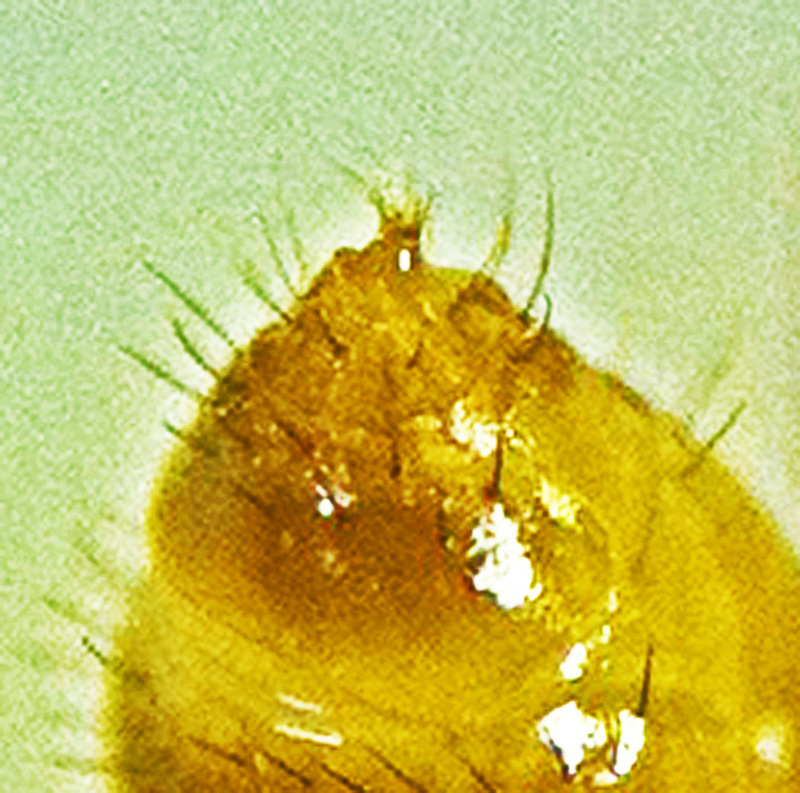 Their petioles (the stem connecting the thorax to the abdomen) were comprised of a single node as with the ants collected on the previous visit, but the petiole was not obscured by the abdomen but easily discerned without manipulating the specimens, and included an obvious postpetiolar structure visible dorsally. As with the ants collected on the previous visit described above, these ants carried no visible stingers, but — unlike the ants collected earlier — in place of stingers each had a ring of hairs surrounding an open, circular, posterior orifice known as an acidopore. These characters, in combination, were suggestive of a new (to Houston) species of ant discovered here by a local exterminator, Tom Rasberry, in 2002. 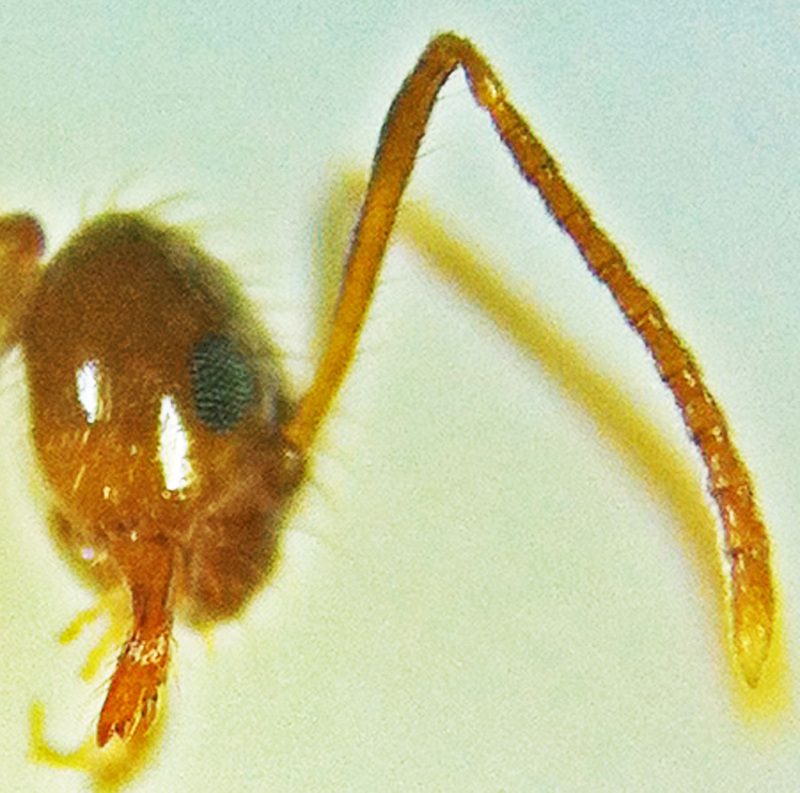 That ant, known today as the Tawny crazy ant, was previously — until the ESA formally recognized it under that common name (Ferro, 2013) — known as the Rasberry crazy ant. It is also now formally recognized under the taxonomical name Nylanderia fulva (Mayr), replacing the temporary taxon Nylanderia sp. nr. pubens, which was awkward at best. This ant is a highly invasive species capable of creating huge colonies of millions of worker ants. Though they do not sting, their minuscule bites — while not known to produce medically significant wounds (if they break the skin at all) — can be disconcerting to those who find themselves covered with thousands of these ants at a time. 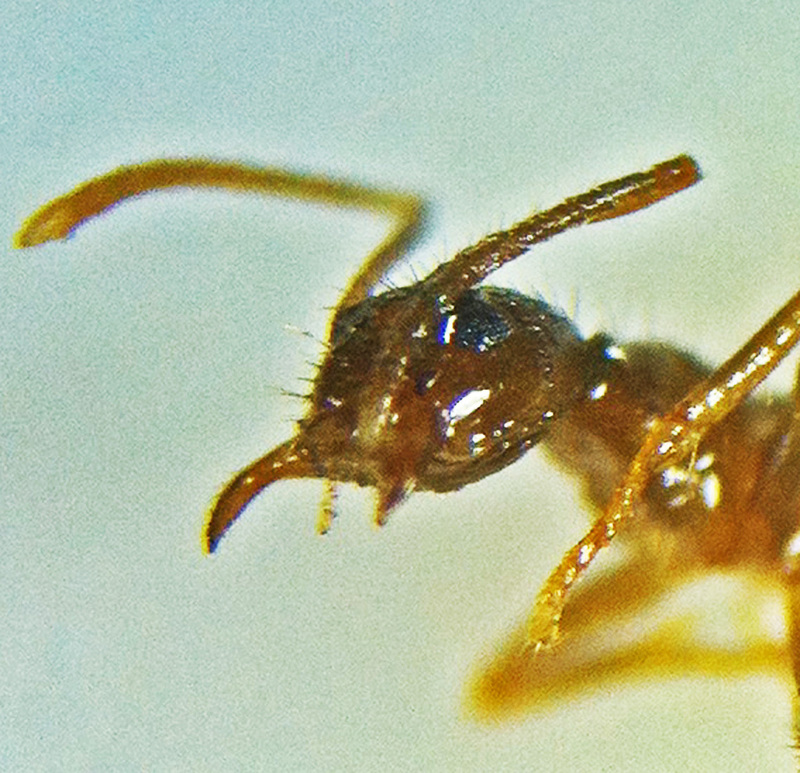 The Tawny crazy ant is today one of the most troublesome ants found along the Gulf Coast. The species has also shown up in other regions, some distance from the coast in Texas, Louisiana, and Mississippi, most likely after being transported inland in shipped goods, timbers, turf, etc. Whether they will thrive far from the Gulf Coast is an open question, but the risk appears significant that they will. The challenge, to me and all who seek to control this pest, is to find a way to deal with them decisively without exposing ourselves and others to pesticidal toxicants that may prove, later, to be worse than the ants themselves. This article, which is a work in progress, will chronicle the work done by others, as well as the work I am carrying out at this and other sites in Texas, to deal with this vexatious and interesting ant. My research on optimal pest management techniques for invasive pest organisms has focused on habitat modification, leaning heavily on the use of insect growth regulators and mechanical modifications of landscape architecture. Although I take advantage of all the pesticides available for such purposes, particularly when the need to bring immediate cessation to an existing infestation is indicated, I have learned — in the course of more than 32 years of active involvement in this field — that habitat modification is always the most effective, safest, and longest lasting approach of all. There is no doubt in my mind that it remains the best approach to dealing with the Tawny crazy ant as well, but it takes time to formulate proper procedures and to implement them once they are established. The program carried out at this medical facility in west Houston, as well as at other sites with similar infestations, will be chronicled here as it unfolds. Fig. 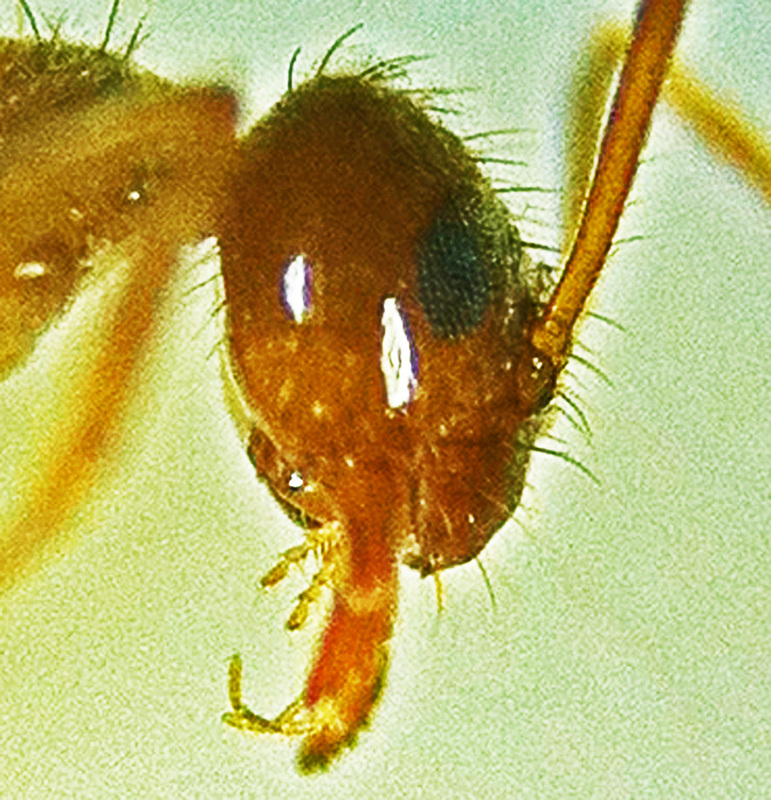 001 is a photograph taken through the lens of the dissecting microscope at the EntomoBiotics Inc. lab, of one of the ant specimens recently collected at the medical facility in west Houston. 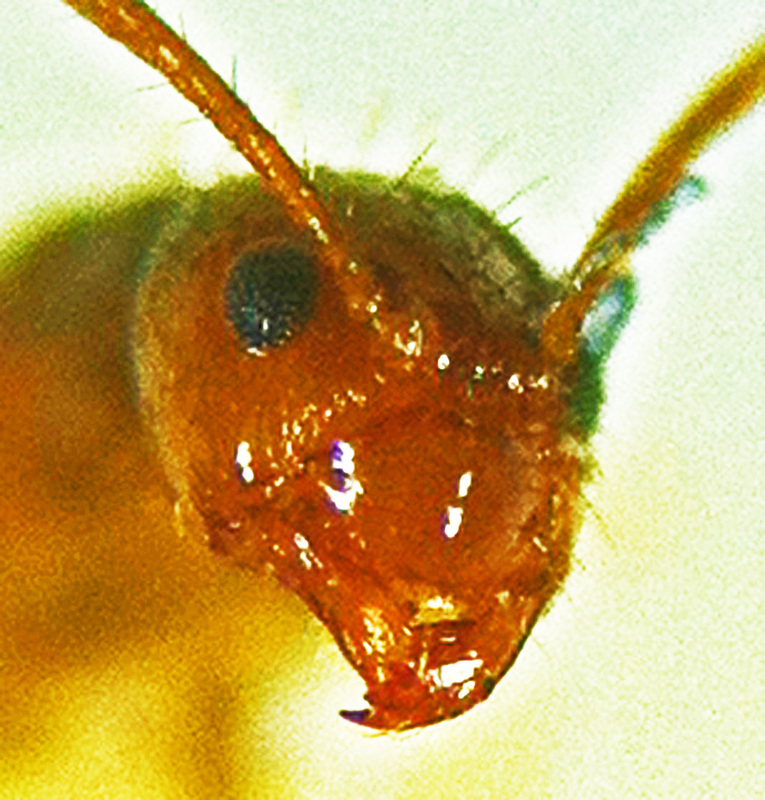 Additional photographs, showing details of the anatomical structures that characterize them as Rasberry crazy ants, have been processed, and are posted below. 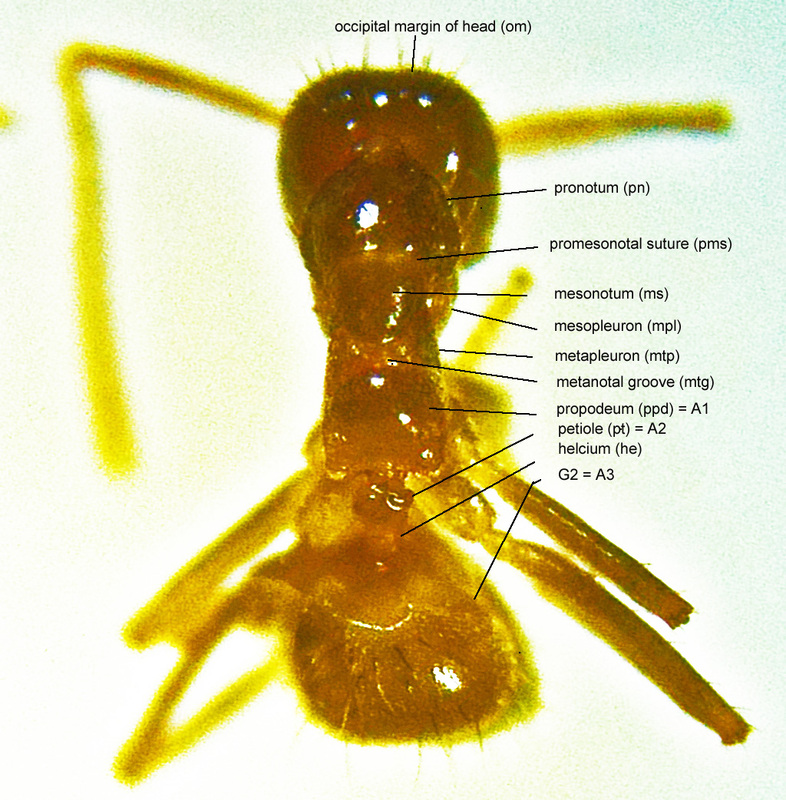 General Anatomy: These ants present with anatomical characters consistent with workers in the subfamily Formicinae (from Bolten, 1994), and the genus Paratrechina/Nylanderia. For more information on these taxonomical units, see the section, below, on taxonomy. The clypeus is broad, from front to back, so that the antennal sockets are well behind the anterior margin of the head (figs. 100-103). 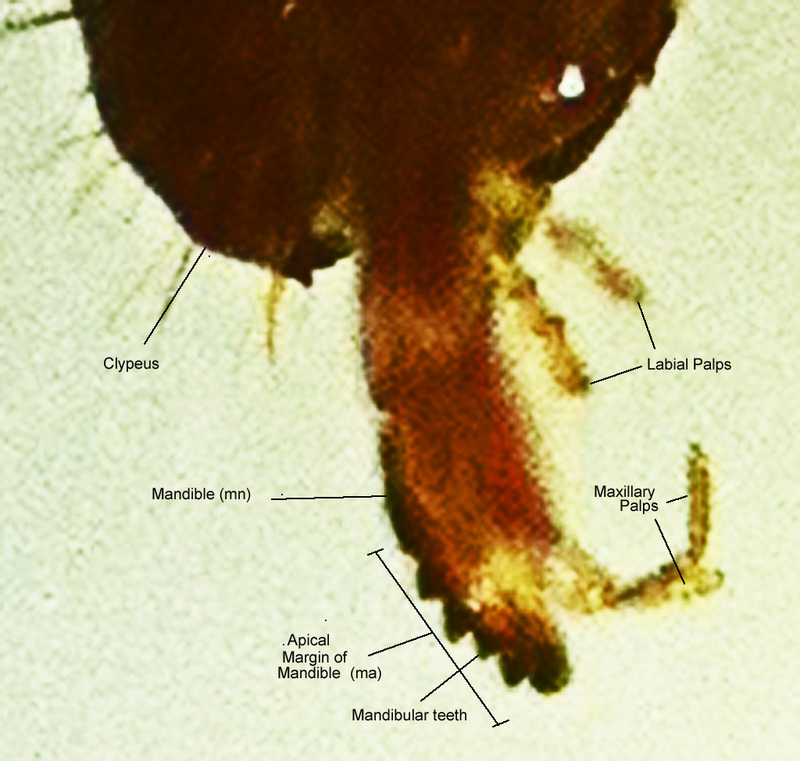 The median portion of the clypeus does not extend backward between the frontal carinae, but a postclypeal frontal triangle is present, projecting back between the frontal carinae/antennal sockets (fig. 101). 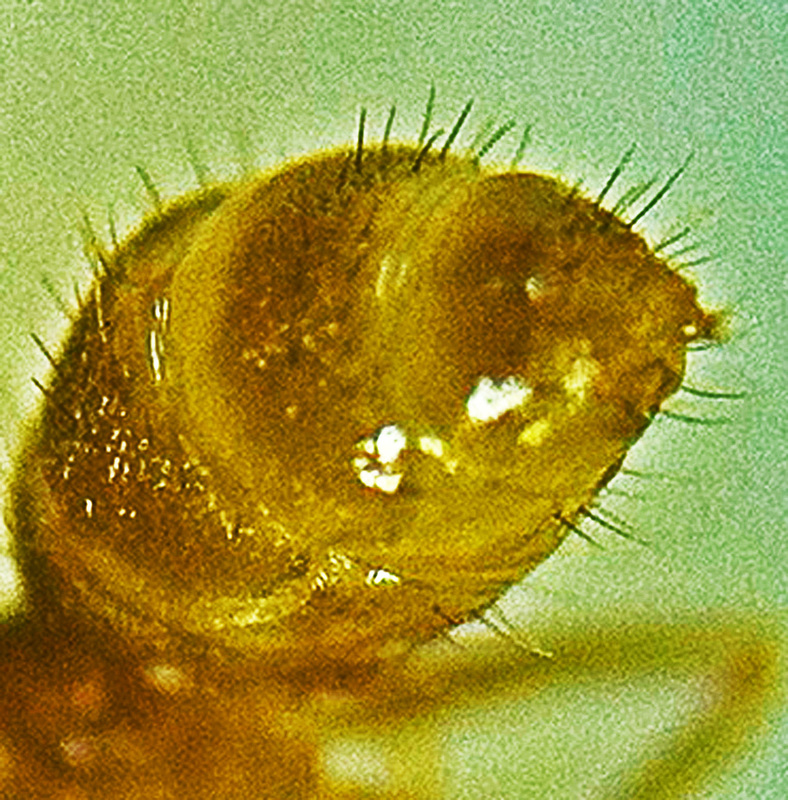 The antennal sockets are inclined such that the portion of the socket margin and torulus nearest the head’s dorsal midline are on a higher level (fig. 101). The frontal carinae are present as simple structures that only partially conceal the antennal sockets (fig. 101). 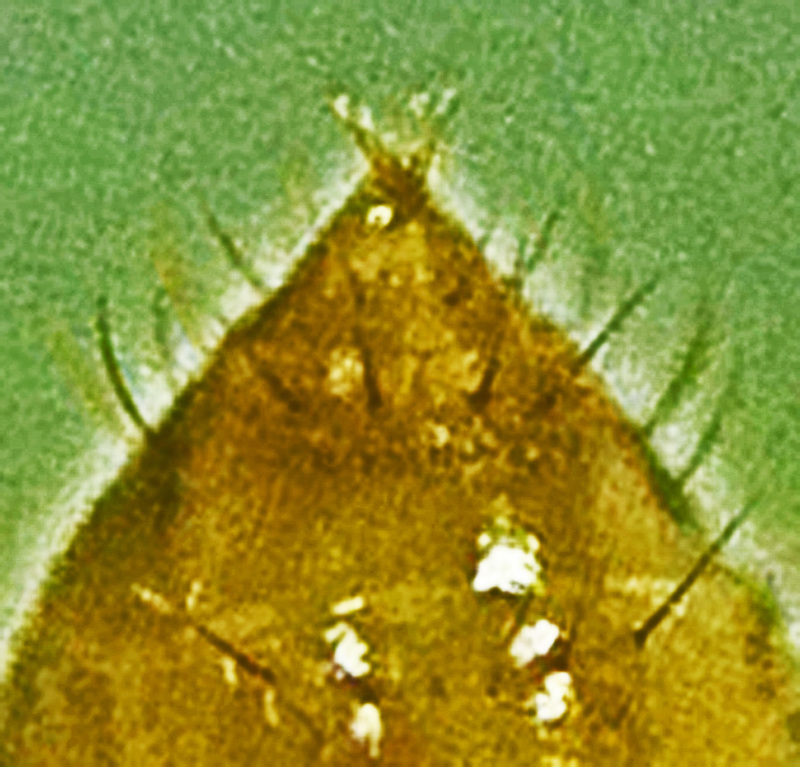 The narrow neck that joins the condylar bulb of the antennal scape to the scape proper is straight (fig. 101). Eyes are present (figs. 100-103), and the antenna has 8-12 segments (fig. 103). A promesonotal suture is present (fig. 104). Metanotum present (fig. 104); note that the metanotum is present in the form of a metanotal groove separating the mesonotum and propodeum, the last vestige of the mesonotum on the dorsal alitrunk. Propodeal lobes are absent (fig. 104). Waist, or petiole, is of a single node (fig. 104). Helcium tergite dorsally with extensive U-shaped emargination of its leading edge, reaching back the major length of the sclerite (fig. 104). Abdominal segment 4 = gastral segment 2, without differentiated presclerites (fig. 109). Pygidium, i.e., tergite of abdominal segment 7 = gastral segment 5, large and simple (figs. 105, 106, 107 & 109). Hypopygidium, i.e., sternite of abdominal segment 7 = gastral segment 5, with a U-shaped to almost circular acidopore apically, which acidopore is equipped with a circlet of hairs (ibid). Sting absent, replaced by acidopore (ibid). Species Nylanderia fulva (nye-lahn-durr-EE-uh FUHL-vuh) — the specific name Nylanderia fulva was first described in 1862 by the Austrian entomologist Gustav L. Mayr (1830-1908), at the age of 32, based on the Latin fulvus, meaning tawny, yellowish-brown, or reddish-yellow. Ferro, Michael L. 2013. Common Name Selection in the Internet Age: A Crazy Case Study. American Entomologist; Fall 2013.